I wish you the warmest of welcomes! 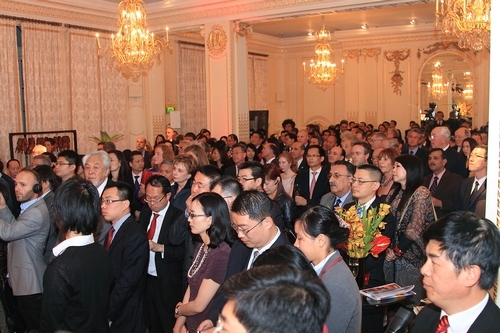 We are gathered this evening to celebrate the 63rd anniversary of the founding of the People’s Republic of China. The birth of the People’s Republic of China 63 years ago ushered in a new era. Emerging out of China’s long history, it is where a new glory and dream began for the Chinese people. This new age realised the manifesto of the Chinese people’s ideal. 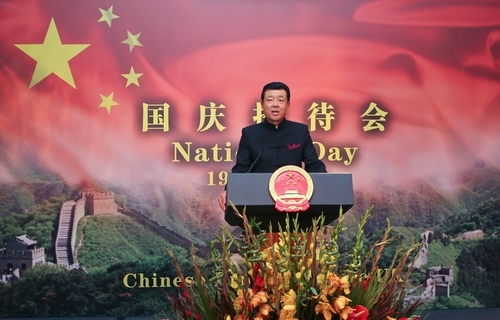 This was to embrace “building China into a country of independence, democracy, peace, reunification and prosperity”. More than twenty two thousand days and nights have followed since the foundation in 1949. During these days and nights, 1.3 billion Chinese people have worked hard in unison and with one conviction. Such unity in mind and action has brought about earth-shaking changes in China across its territory of more than 9.6 million square kilometers. These changes are reflected in China’s extraordinary economic growth. Since reform and opening up, China’s GDP has been growing at an annual rate of 9.9% for over three decades. This is truly a wonder of the world created by China. As a result, China has soared to the world’s second place in economic size and trade volume. These changes are reflected in China’s overall progress. While going all-out for economic growth, China has also made tremendous efforts to advance progress across political, cultural and social fields. The final goal is to achieve ‘scientific development’. By ‘scientific development’, China aims at a comprehensive, coordinated and sustainable development that puts people first. These endeavours have unleashed the dynamism and creativity of Chinese society like never before. These changes are also reflected in closer links between China and the rest of the world. China has opened its door to the world. In building international relations China pursues mutually beneficial cooperation with other countries. China also takes an active part in global and regional affairs and displays its international responsibility as a large developing country. As China grows, its contribution to world peace and development is increasing by each passing day. Today China is at a critical juncture. As China builds on the remarkable achievements of reform and opening up, it also faces opportunities and challenges. To adapt to the new realities, China will work hard in the following areas. China will shift its growth model. 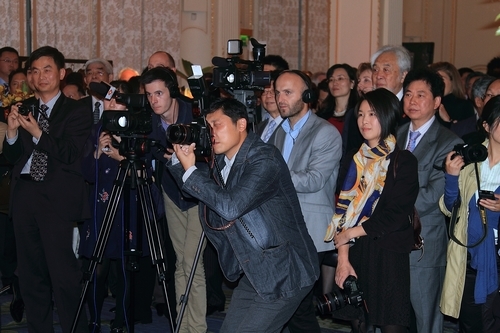 · China will strike a balance between exports, investment and consumption. · China will aim to mainly rely on domestic demand and innovation. · And China will strive to meet growth targets while maintaining stability. China will steadily push forward economic reform. This will mean breaking the bottlenecks constraining the economy and tap the potential of social productivity to the full. · and realise human freedom and equality. China will remain committed to open and peaceful development. · and work with other countries for world economic recovery. Meanwhile, China will stay on the path of peaceful development; it will achieve development in peace, by peace and for peace. This year also marks 40 years of full diplomatic relations between China and the UK. Over the past four decades, China-UK relations have come a long way. Our cooperation in various fields has steadily moved forward and produced outcomes on all fronts. The foundation and bonds of China-UK ties have strengthened as understanding and friendship between our peoples keep deepening. The two countries have put in place the ‘economic and financial dialogue’, the ‘strategic dialogue’ and the high-level ‘people-to-people dialogue’. These dialogues constitute three pillars of China-UK relations. Supported by these important mechanisms, mutual investment, cultural and personnel exchanges between our two countries are going full steam ahead. However, we should recognize that China and the UK differ in history, culture, development stage, and social system. We will therefore inevitably have different views on some issues. To properly handle these differences, we should respect each other and seek common ground while putting aside differences; rather than imposing one’s own will on others. We should strengthen dialogue and communication and enhance mutual understanding and mutual trust; rather than engaging in “megaphone diplomacy”. We should effectively manage and control differences; rather than allowing them to stand in the way of our overall bilateral relations. In today’s world of the 21st century, China and the UK, as two important countries of major influence, should build a positive and healthy relationship defined by political mutual trust, economic mutual benefit and cultural mutual learning. This means our relationship should be one of continuous progress and comprehensive cooperation. To build such a China-UK relationship is my mission and my goal. I believe this is also your mission and your goal. So let us work together for its accomplishment.